All of the education birds at the Black Hills Raptor Center are permanently injured. For some the injury is physical. For others the injury is mental. Our US Fish & Wildlife Service permit requires that our avian ambassadors be non-releasable. At present we focus our education on species native to our state of South Dakota. Hendrix is an imprinted bird. He was with humans at a critical time of his development as a chick, so he is confused about his species. He has no fear of people, and is quite willing to vocalize in ther presence of humans. He weighs 4 ounces, or the same as a stick of butter. 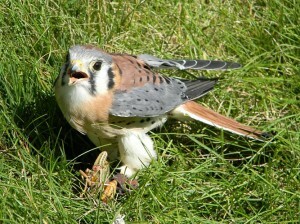 Kestrel prey items are sparrow sized birds, mice, and grasshoppers. Because most American kestrels migrate out of South Dakota for the winter months, the US Fish & Wildlife Service requires that we provide supplemental heat to any kestrels on our education permit. To accomplish this, we house Hendrix at the home of co-founder John Halverson. The two are very bonded, and in the spring Hendrix treats John as a mate. Hendrix begins calling at sunrise each day, and won’t stop for about 5 hours. His goal is to bring his “mate” to him. The bird usually spends a few weeks during the height of the breeding season in an aviary, or mew, in Maggie’s back yard. This allows John to get some sleep, and diminishes the bond between bird and man. Photo by Maggie Engler. Enjoy this video of Hendrix in action at the Earth Day Celebration in 2013. Eastern screech owls have two color phases. The more brown/gray patterning is more common the further west you travel in the bird’s range. “”Little Red” has no vision in one eye, and it is limited in the other. The injury was likely caused by a collision with a vehicle. She came to the Raptor Center from Raptor Rehabilitation of Kentucky, Inc. in Louisville. Most often screech owls will call in the springtime, as they first seek a mate. Calls also serve to keep the pair bond strong while the young are being raised and fledged from the nest. Look for eastern screech owls in broken off tree branches, or hollows in tree trunks. The queen of the prairie, a ferruginous hawk is the largest North American buteo. The buteos are the family of hawks that sit on perches to pounce on their prey, or soar in the air in search of food. Ferruginous hawk food items include prairie dogs, gophers, and large snakes. Most ferruginous hawks are very fierce and formidable birds. Nesting on the ground, and most often eating on the ground, put both adults and young in almost constant danger from other predators. To protect themselves, they are very hot tempered and unpredictable. Phoenix is a victim of West Nile Virus, which caused her to have permanent brain damage. Hunting for herself is no longer possible. Unlike most ferruginous hawks, she is fairly easy to handle and deals well with being an avian ambassador. We think the disease that grounded her has changed her personality. Photo by Kristi Harper. Eastern screech owls have two color phases. The more brown/gray patterning is more common the further west you travel in the bird’s range. “Wolfie” has no vision in one eye, and it is limited in the other. The injury was likely caused by a collision with a vehicle. She came to the Raptor Center from Raptor Rehabilitation of Kentucky, Inc. in Louisville. Typically non-vocal, eastern screech owls are a very common species. Their small size makes them easy meals for larger predators. Because they have such excellent camouflage, they are rarely seen. Their camouflage is made even better by the uncanny ability to stand without moving for hours on end. It is important for a screech owl to be still in order to survive undetected. Photo by Kristi Harper. Our prima donna hatched in Arizona in 1989. Stolen from her nest by people who wanted a unique pet, she became imprinted on humans. When rescued by Arizona Game & Fish a few months later, she was terribly sick from being fed an incorrect diet. She came to South Dakota to Reptile Gardens in 1990 and began flying in bird shows on their grounds. Eventually she began to be part of school presentations. She has been with the Black Hills Raptor Center since our founding in 2010. She has visited almost 2500 classrooms in her career as an educational ambassador for all birds of prey. Photo by Emily Calhoon.